Like we weren’t already in love with resto bar Black Rabbit’s funky atmosphere and delicious food, now we can’t get over their quirky and fun range of shots and drinks. Gather your squad and head down to the Black Rabbit to try out their Candy Shop series of shots and cute and fruity cocktails. 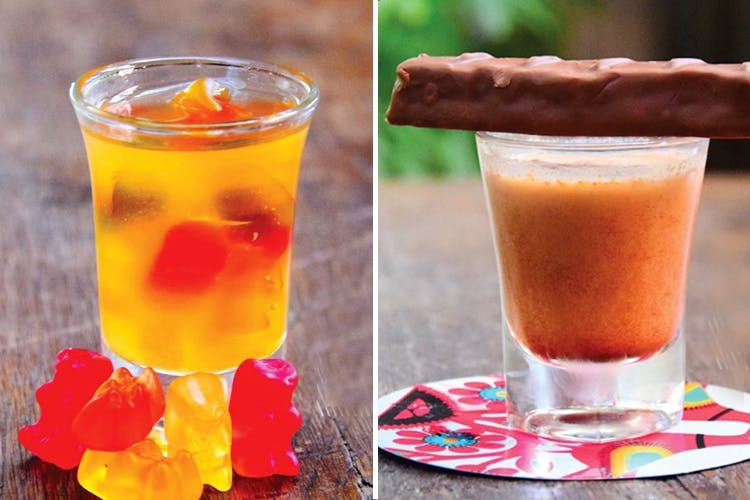 Be prepared to drink your favourite childhood candy with a little alcoholic twist. The Candy Shop shots include shots called the Gummy Yummy — vodka soaked gummy bears served with triple sec and lime, and Snicker Licker with ice cream, kahlua, vodka and snickers, all starting at INR 245. What can be better than alcohol and candy all in one? So. Much. Win. If shots aren’t your thing that’s cool too, because The Black Rabbit serves a big selection of chocolatey/sugary cocktails as well like the the Choco Loco served with vodka, kahlua, ice cream and sugar syrup. Try out their wide range of fruity cocktails like the Blood Orange Mimosa which has sparkling wine, blood orange and maraschino cherries and I Dream Of Gin-Nie which includes gin, cucumber, basil, mint and lime.